This private hunting lodge outside of Lednice in the Czech Republic quietly emerges from the ground like a stone covered with earth and moss. 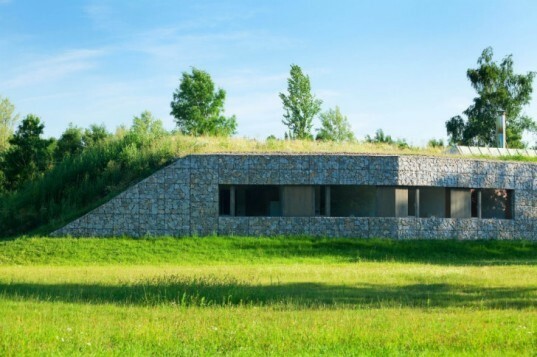 Designed by Czech firm Basarch, the hunting lodge is topped with a green roof and finished with an exposed stone wall. While we're certainly not condoning what the lodge is used for, we can't help but admire the design's use of daylight and simple material palette. Basarch’s private hunting lodge is located on a game preserve near Lednice in the south of the Czech Republic. One side of the linear home is bermed to protect it from the sound of a nearby highway. A green roof grows up and over the home to further encase it and protect it while also providing increased insulation. The berming and green roof effectively replace the green space that was removed to build the house, providing rainwater infiltration and natural habitat. The one exposed site is built with gabion baskets filled with stone and floor-to-ceiling glass walls. This exterior makes the lodge appear as a large stone covered with grass in a meadow, and the stone provides lots of thermal mass to help regulate the interior climate. The porch features a large storage space for split wood, which is used to heat the home via the stove inside. A large skylight in the green roof fills the interior with daylight. The interior is sparsely and simply decorated with white, light-bouncing walls, and wood furniture. We certainly don’t like the animal trophies used throughout as decor, but we can appreciate a good earth-bermed, green-roofed house. Basarch's private hunting lodge is located on a game preserve near Lednice in the south of the Czech Republic. One side of the linear home is bermed to protect it from the sound of a nearby highway. A green roof grows up and over the home to further encase it and protect it while also providing increased insulation. The berming and green roof effectively replace the green space that was removed to build the house, providing rainwater infiltration and natural habitat. The one exposed site is built with gabion baskets filled with stone and floor-to-ceiling glass walls. 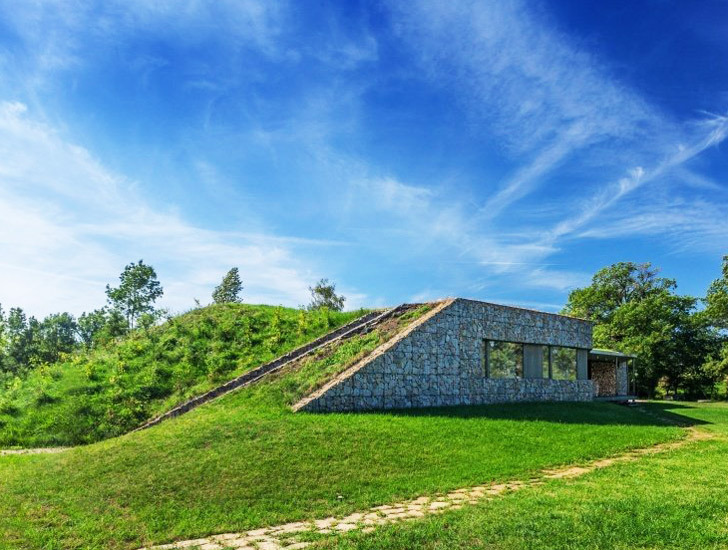 This exterior makes the lodge appear as a large stone covered with grass in a meadow, and the stone provides lots of thermal mass to help regulate the interior climate. The porch features a large storage space for split wood, which is used to heat the home via the stove inside. A large skylight in the green roof fills the interior with daylight. The interior is sparsely and simply decorated with white, light-bouncing walls, and wood furniture. We certainly don't like the animal trophies used throughout as decor, but we can appreciate a good earth-bermed, green-roofed house. An entry and storage area that works as a mud room.